Canon EOS 2000D initial review: Asserting DSLR's entry-level place in a smartphone world? The camera market is more divided than ever before. Hot off the heels of Samsung announcing its new flagship S9 smartphone at Mobile World Congress 2018 - with a dual aperture lens camera unlike anything in a phone before it - Canon, in a sphere all of its own, announces its newest entry-level DSLR: the EOS 2000D. Which is an interesting dichotomy, especially with cash-strapped consumers who might be thinking a pocketable top-tier phone (a £850+ one, at that) might be the answer compared to a bulkier, traditional (and admittedly cheaper, at £470) entry-level DSLR camera. Still, the 2000D - which replaces the 1300D in the line-up - makes good on Canon's long-standing affordable range, upping its predecessor's pixel count to match much of its range, at 24-megapixels. And, of course, with a large-scale sensor at its core this "proper camera” has the scope to be an imaging delight. Is it good enough to continue to lure in the punters, or has the entry-level DSLR market run out of tricks? The EOS 2000D doesn't pull any surprises. This is Canon doing what Canon does, utilising its established DSLR design to push that familiarity to new users who can then take that on board and continue to grow through Canon's more advanced and pricier range. That's what the brand will be hoping for anyway. Don't expect any fancy weather-proofing finish, don't expect any vari-angle LCD screen, or top-tier viewfinder. But the 2000D does squeeze in the essentials: it's a solid wedge of a camera, the 3-inch screen is on par with the majority of screens found in cameras, while a built-in optical viewfinder is a great way for newbies to start to get to grips with such a way of shooting. At this entry-level, however, the viewfinder only presents 95 per cent of a scene (the outermost five per cent can't be seen, but is captured), which holds it back from being a better, larger offering - as you'll find elsewhere in that range. That said, it does present light-up autofocus points to the eye, overlaid in the finder window, which is great for seeing what's getting locked into focus and where when using the camera. Like so many recent Canon DSLR cameras, the 2000D also embodies Wi-Fi connectivity. Download the Canon app (for iOS and Android) and it's possible to share images straight from the camera to smart device to make for easy editing and sharing on the fly, minus a full-scale computer setup. Although we weren't able to try it, Canon has also introduced an auto-transmit feature so that all images shot on the DSLR will be sent over to the app without the need to muck about with various button presses. A nice idea. One thing is slightly amiss, however. When Canon introduced the 800D and 200D - note, the smaller the number the more "pro” the camera - it pushed its new Guided UI user interface along with them. The idea being simple: to offer visual aids and a simplified user interface to make it easy to comprehend what a mode does and how to use controls to your advantage. This is absent in the 2000D - we asked Canon at our demo day to make doubly sure. There's some guidance in the camera, but it's not the full-on experience - which we find a bizarre proposition considering the fuller EOS line-up. We were able to use the 2000D for a short period of time watching cocktail bartenders mixing up a variety of drinks. It presented a good opportunity to grab some action shots and candid snaps of the barkeeps from afar dressing glasses with lemon twists and the like. The 2000D's 9-point autofocus system - which, as we said above, is visible through the viewfinder - is adept at snapping into focus, with different points available to select as you please for creative focus. However, with limitations to autofocus speed in live view mode - that's when using the rear screen to shoot rather than the viewfinder - and no vari-angle bracket to position the screen in some more practical off-camera positions, the 2000D quickly finds its limits compared to, say, a similar-price mirrorless camera (which offers faster on-screen autofocus, typically). The biggest take-away in the 2000D compared to the older 1300D is that its resolution has been increased, hitting the 24-megapixel mark. With the older-men Digic 4+ processor working behind the scenes this is an adept setup, but not the most recent. That said, whether you buy 2000D, 200D, 77D, or any other recent 24MP Canon DSLR, the image quality will be one and the same - it's down to the lens attached to the front and various features that will add tools to the feature belt and aid capture in other ways. The benefits of a DSLR over a smartphone are apparent when viewing images at a larger scale, so if you're serious about more than a casual share on social media then the 2000D does open the door in that regard. There's more immediate control too, while lower-light conditions don't affect results as drastically as you'll find from a phone camera. Back to our opening gambit: is the entry-level DSLR still relevant in the smartphone era? In short: based on image quality alone, yes, the Canon EOS 2000D continues to show its worth. Samsung, Apple, Google, et al, might have their impressive phones, but Canon's years of experience still put it well ahead - so long as you can cope with lugging around a far larger camera. That said, the 2000D could do with amping up its screen-based live view autofocus, add touchscreen controls and some other trinkets to make it that much more user friendly. But then, of course, you could spend some extra cash and find such features further up Canon's range. 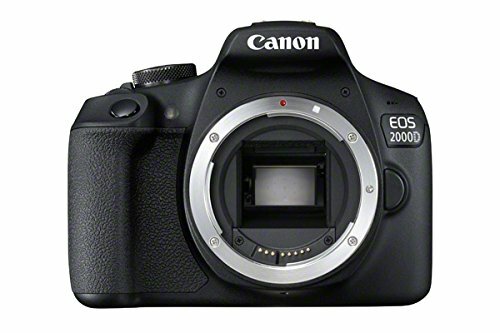 The 2000D is, after all, one of 15 EOS DSLR cameras in the company's dominant range. There's something for everyone, at every price point.